All In Energy addresses four interconnected issues: (1) Climate change mitigation efforts are too slow. (2) Low income and diverse communities are not benefiting from state energy efficiency programs at the same rate as wealthier, whiter communities. 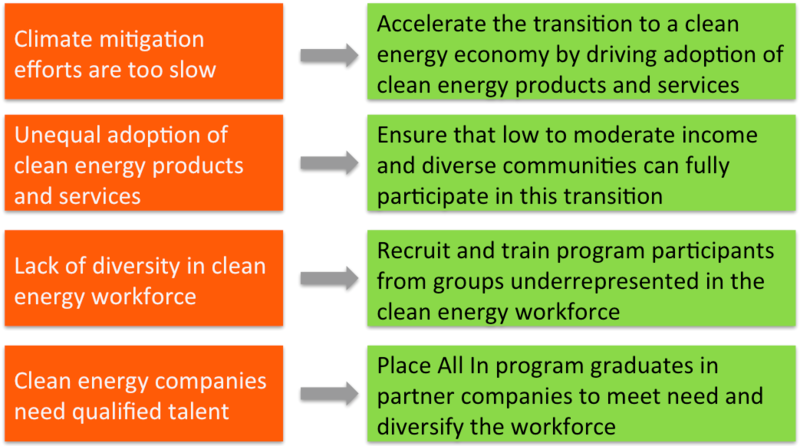 (3) Women and people of color are underrepresented in the clean energy workforce. (4) Clean energy companies report difficulty finding new hires with sufficient technical knowledge and experience. Our campaigns are largely executed by high potential individuals from populations underrepresented in the clean energy workforce. The career pathways program provides graduates with the skills and experience to place them into full time, permanent positions in partner clean energy companies.